Still recovering from all the wining and dining this past weekend. Posting photos with some rambling now, recipes may come afterwards. Wednesday – Family friends came to the house from Boston, bearing nine, gorgeous live lobsters. We found this out after we’d already steamed a dozen Chesapeake blue crabs and purchased an entire roasted duck. Opened a bottle of Marques de Riscal and had a happy time around the table. Surprisingly finished almost all the food we had to eat. Thursday – Thanksgiving at Nan’s in Long Island. Met her fiance, James. They’re so cute together. Two whole turkeys, endless side dishes, four giant desserts. Nan’s zombie, hairless cat named Zoey who hissed at me when I tried to take her photo. Failed at working off calories by playing Wii Home Run Derby. Food coma all the way home. Friday – Post-Turkey Day reunion with high school friends. Lots of wine and cheese. Giant eclair cake. Essentially, take vanilla pudding mixed with equal parts cool whip. Start with layer of original graham crackers. Top with pudding mixture. Alternate layers. End with graham crackers on top. 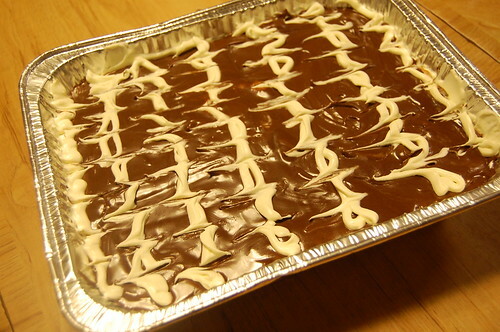 Cover in melted chocolate frosting. Make pretty design with any leftover pudding mixture. Let chill in fridge for 2 hours so crackers get crumbly. Let everyone who eats it believe that it was insanely complicated to make. Puahaha, suckers. Saturday – Visited Nan in NYC. Ate and ate and ate,including smores. Watched Zombieland, laughed at Tallahassee and cried at the blood and gore. Joe is a LIAR. More wine and Wii. Played House of Dead and shot fake zombies to make myself better about the movie. Could not sleep. Sunday – Woke up to zombie cat Zoey staring me in the face. Huge farmer’s breakfast at Cornelia Street Cafe and Bakery. Murray’s Cheese on Bleecker. IBERICO HAM. Home. Birthday noodles, pre-20th bday celebration with fam. Thanks for the gifts! Pass out. 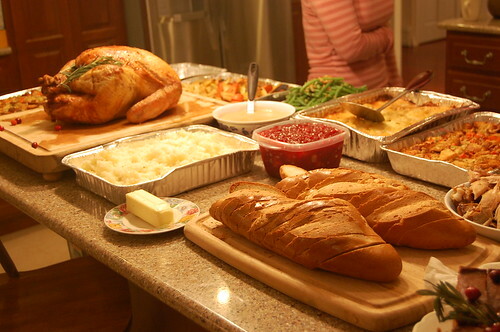 You are currently reading Thanksgiving Weekend Round Up at Notes on Food.